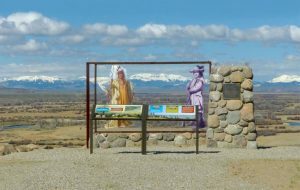 The Sublette County Historical Society is excited to announce the completion of upgrades to the Trappers Point Overlook. A 50th anniversary re-dedication ceremony will take place on Thursday, July 12, 2018 at 10:00am at Trappers Point. 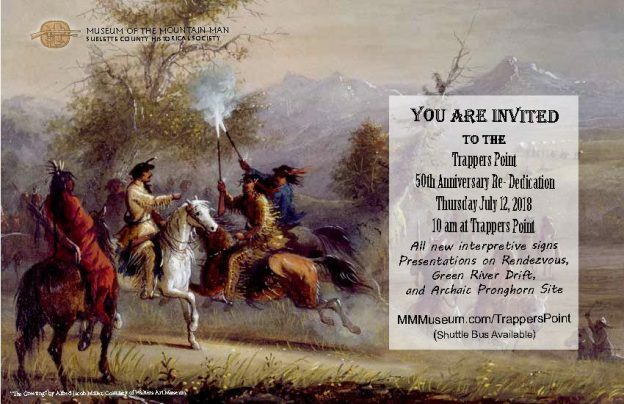 Fur trade historian Jim Hardee will discuss the historic Green River Rendezvous, State Representative Albert Sommers will talk about the Green River Drift, and former Wyoming State Archeologist Mark Miller will describe the significance of the Trappers Point pronghorn archeology site. A free bus, sponsored by Sublette BOCES, will leave the Museum of the Mountain Man at 9:30am for those who would prefer not to drive. Registration for the bus is recommended and available online at http://www.subletteboces.com/classes/. This project restored and reinvented the Trappers Point Overlook monument and signs. The 10-acre site is owned and managed by the Sublette County Historical Society. Trappers Point started in 1968 as a location to overlook a newly established National Landmark, the Upper Green River Rendezvous Grounds, where six mountain man rendezvous were held from 1833-1840. The original dedication took place during Green River Rendezvous Days in July, 1968. Since that time, the location has become more significant, now overlooking two newer National Register of Historic Places sites: the Green River Drift and Trappers Point Archeology. All three sites are of national significance. After 50 years, the overlook was showing signs of wear. It needed to be modernized while still respecting its own heritage and adding interpretation of the newly designated historic resources. Because this site is the junction of three major historical activities (Fur Trade Rendezvous, Pronghorn migration archeology, Green River Drift cattle operations), and has three designations on the National Register, this is a very important and complex historical site. It has received even more national recognition with Wyoming investing in new wildlife migration overpasses and underpasses along US 191 between Pinedale and Bondurant to protect migrating pronghorn and deer. Drive 5 miles West of Pinedale on US Hwy 191 to the Cora Junction. Turn South on East Green River Rd. In 200 yards turn right at the Trappers Point Sign. It is a 1/4 of a mile walk up to the top of the hill. Trappers Point overlook is a 10-acre site owned by the Sublette County Historical Society (SCHS) surrounded by federal land near the Cora intersection on U.S. Hwy 191, approximately 5 miles west of Pinedale, Wyoming. The site is surrounded by federal land managed by the Bureau of Land Management (BLM). The land was transferred from Bureau of Land Management to the SCHS in 1963 to establish a monument site overlooking the confluence of the Green River and Horse Creek area where six mountain man rendezvous were held from 1833-1840. The Upper Green River Rendezvous Grounds encompasses 1280 acres of private ground. It was one of the earliest National Landmarks designated in the United States (1961) and is still one of only 25 in the state of Wyoming. The Trappers Point monument was dedicated on July 14, 1968. The mountain man era and rendezvous site have been featured in many magazines and documentaries. Most recently significant attention has been brought to the era by the Academy Award winning movie The Revenant. Museum of the Mountain Man historical consultant Clay Landry was also historical consultant on the movie. Related websites: MMMusuem.com, HughGlass.org, and AlfredJacobMiller.com. Trappers Point overlook is on a high ridge between the Green and New Fork rivers. Looking east from the high vantage point, the entire extent of the 100-mile-long Wind River mountain range from South Pass to Union Pass can be seen. In addition to the rendezvous monument, an interpretive sign naming the Wind River mountain peaks was also dedicated in 1968. During construction on U.S. Highway 191 in 1992, an ancient pronghorn (antelope) kill site was discovered adjacent to Trappers Point overlook, thus adopting the site name. Archeological investigations determined that pronghorn have used the area for thousands of years and humans were hunting at the site as many as 6000 years ago. The Trappers Point Archeological Site was listed on the National Register of Historic Places in 2007. Pronghorn migrate through Trappers Point bottleneck to this day. Study of this seasonal migration started in 2003 and resulted in two wildlife overpasses and five underpasses being built in 2012. The purpose of the over and underpasses was to provide safe passage for wildlife across U.S. 191 to minimize pronghorn and vehicle collisions causing injury to people and damage to vehicles traveling through wildlife crossing sections along the highway. The wildlife overpasses are the first of its kind in Wyoming and part of the Path of the Pronghorn, the Nation’s first federally protected wildlife corridor. Trapper’s Point Archeological Site was featured in an episode of Wyoming Mainstreet in 2016 on Wyoming PBS. Related website: TrappersPoint.com. Just as wildlife migrate through Trappers Point bottleneck between winter pastures to the south and summer pastures to the north, cattle have been moved back and forth on the same route to summer pastures in the Upper Green at least since 1896. The trail is still in use today and referred to as the Green River Drift. In the 1920s, a fence was constructed at what would become Trappers Point to stop cattle drifting down from the forest in the fall. Here the cattle are sorted into individual ranch herds and taken to their respective winter homes. The drift fence and sorting grounds located at Trappers Point are a significant landmark on the Green River Drift. The Green River Drift was listed on the National Register of Historic Places in 2013 as a Traditional Cultural Property (TCP), the first ranching-related TCP in the nation. The Green River Drift is featured in an hour long documentary by Wyoming PBS released in November 2016. Related website: GreenRiverDrift.org. This convergence of three nationally significant historic sites, in combination with two major river systems (Green River and New Fork River), the Wind River Mountains (Continental Divide), active wildlife migration, and traditional cattle use make Trappers Point significantly more important than when it was first dedicated in 1968. Approaching 50-years old, the overlook and monument themselves have become historic attracting thousands of visitors each year.